Bringing Om to Carl Schurz Park, Outdoor Yoga in New York City! Being stuck inside all day in the office and surrounded by technology, stress, and deadlines depletes our Prana -life force. Take advantage of nature near you and participate in an al fresco yoga class at Carl Schurz Park on the Upper East Side! A picturesque park with flowers, lush landscapes, and sweeping river views, Carl Schurz is the perfect spot to unite mind, body, and soul with a revitalizing, transformative yoga class. Yoga was originally performed outdoors in it's native country of India, with the purpose of uniting us with nature. Being surrounded by nature awakens your senses, enhances your focus and concentration, and helps you to reconnect to your true-self. There is nothing more rewarding than seeing the actual sun while doing Sun Salutations, feeling the breeze on your face while practicing Tree Pose, and grounding with the Earth while being barefoot. It is a very therapeutic and healing experience, that leaves you feeling recharged and alive. The aroma of flowers and fresh air helps you to stay present and improves your conscious breathing, guiding you to become more mindful. What a unique way to appreciate the world around you from upside down under the open sky! Forgot to bring a mat? You can utilize nature's yoga mat - soft, green grass! It is a nurturing practice, which will strengthen your body, profoundly calm your mind, and nourish your spirit. You will feel as though you took a mini-vacation outside of Manhattan! Carl Schurz Park is our personal yoga studio, where the sun is our light, the breeze is our air conditioning, and the trees are our doors. Click the link below to see the calendar of Yoga out of Doors classes! "The Light In Me Honors The Light In You" by Karla Gudeon, click image to purchase! Every year since 1972, Carl Schurz Park holds the Gracie Square Art Show, with artists from all around the country. Last year, while I was browsing through the different booths, I was drawn almost magnetically to an inspiring piece resembling Ganesha doing an asana. As a yoga practitioner, I appreciated his playfulness in the tree pose, his peacefulness, kindness, as well as the soothing, pleasant colors of the lotus. I was really impressed by the intricate details and it turns out that even the paper is made by hand from jute, a plant based product! All of this incredible work is done by a unique artist named Karla Gudeon. Her images have been commissioned for book covers, calendars, greeting cards, and award-winning children's books. I had the opportunity to speak with her about how yoga inspires some of her work and about what Yoga out of Doors has been doing to contribute to the fight against cancer. Today, I am so excited to announce a partnership between Yoga out of Doors and Karla Gudeon. Purchases of all of her artwork within the "Little Ones" collection with the promo code MSKYOGA will have a portion of proceeds donated to Memorial Sloan Kettering Cancer Center to help fund life-saving cancer research! We are very grateful for her generosity and highly recommend for our readers to look through her website! The works make great gifts for friends and family, beautiful additions to yoga studios, and a decorative touch to your personal altar. "Namasté" by Karla Gudeon - click image to purchase! Karla incises the outline for each of her designs into a metal plate. She then inks and wipes the plate so that only the black lines appear on paper when the print is pulled through the press. For each individual image in the limited edition, Karla repeats the intaglio process. She paints each work of art in lush, rich watercolor, thus achieving one-of-a-kind status for each piece. Karla creates joyous images that resonate with life-affirming spirit. Click to view more art from the "Little Ones" collection! United by Yoga and Art to End Cancer! Yoga out of Doors featured in March 2015 issue of Yoga Magazine! Yoga out of Doors is a yoga community of like-minded people who enjoy practising yoga as a path to self-discovery and as a tool to inspire social change. Our mission is to use the power of yoga to encourage healthy lifestyles while raising money from our classes, workshops, and events towards the fight against cancer. 100% of the donations benefit life-saving cancer research at Memorial Sloan Kettering Cancer Center (MSK) in New York City. MSK is the world’s oldest and largest private institution devoted to prevention, patient care, research and education in cancer. Doors can be literal or metaphorical – yoga allows us to open wide our physical, mental, and spiritual doors, while deepening our connection with ourselves, others, and the Universe. Yoga out of Doors will help you to move through the doors of your perception to love who you really are – free, peaceful, and happy! Our classes are held in parks, studios, schools, offices on the beach – practically anywhere! October is National Breast Cancer Awareness Month, and last week I was invited to Alfred E. Smith High School in the Bronx, NY to talk about how yoga can help us stay healthy, maintain proper body weight, and keep us active. At the end of the presentation, I taught an introductory class to some of the students, who were very interested in yoga and were eager to learn. They are so full of youthful love and light - they will be able to shine it everywhere! I am so grateful to have been a part of that experience and hope that they will continue practicing yoga! On October 12th 2014, Yoga out of Doors held a workshop at Regenerate Fitness on the Upper East Side in NYC. In addition to an hour and a half of invigorating yoga practice, participants had the opportunity to discuss and share their outlooks from before and after the class. We would like to thank Jeni Fujita and Reggie Cooley for their support and allowing us to make this workshop possible! This is a very cozy and accommodating studio, which provided the perfect atmosphere for a great yoga class! We are proud to announce that we raised $120 for life-saving cancer research during this class, thanks to generous donations by our participants! United by Yoga to end cancer! Tomorrow is not here yet. I am thrilled to have been a part of this year's Ahimsa Festival! It took place in Windham, NY, which was a perfect reflection of the beginning of Autumn - a mini-escape from busy New York City. It was a two day festival that celebrated yoga and music, providing the opportunity to meet new teachers, get introduced to new, emerging yoga styles, all while being surrounded by beautiful, majestic mountain scenery. Throughout the festival, you could hear the Kirtan music floating in the air, which kept a smile on every participants face! Sondra Loring swept us away in her yoga class with her incredible harmonium playing, accompanied by Steve Gorn who played flute. The entire class felt a sense of community and devotion. The whole experience just truly felt warm and inviting, despite the challenging and strong yoga class itself. 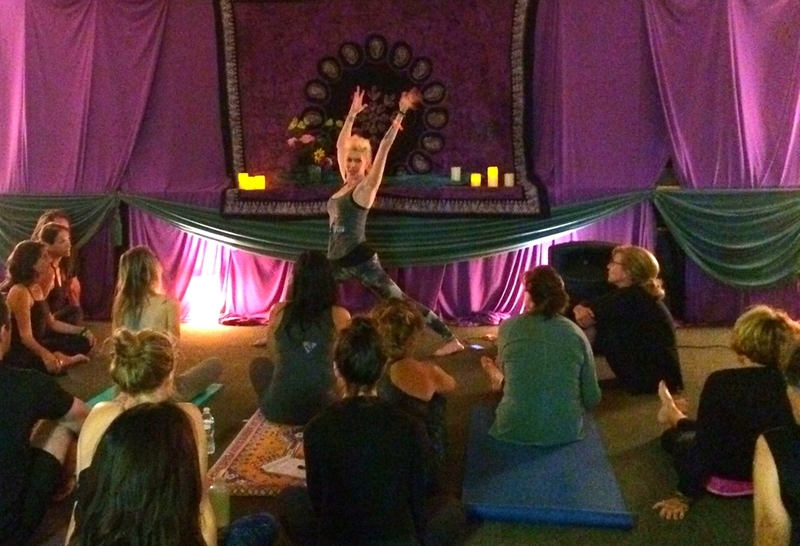 The always unique Sadie Nardini, the founder of Core Strength Vinyasa Yoga, taught for two consecutive days at Ahimsa. She focused on mindful transitions, building poses from the ground up, and concentration on activating the core muscles. One of her many innovative styles she introduced in the class, was the idea of not using linear postures, but to think outside the box and utilize all of the space around you as a personal canvas for expression. She rocked the room! Meghan Currie gathered yoga teachers to learn and share in her workshop "The Symphony of Sequence". It was an open-styled workshop where teachers were encouraged to add their input, share their expectations, and to discuss just what makes an epic Yoga class. She highlighted that yoga teachers are the conductors of the energy shared within a class, that we are "open channels for creative energy to pass through". She emphasizes that we as teachers are able to create a beautiful symphony. She inspired the teachers to create organically, with no set template, and to be more playful and original in their teaching approach. The magic of the Kirtan performed by many well-known Bhakti musicians immersed us in the sound and established a harmony within the room and our hearts, where everyone was able to feel love, light, and intention. Enjoy the fantastic performances by Masood Ali Khan and David Newman, Adam Bauer, and Brenda McMorrow! Thank you so much Ahimsa, looking forward to next year! Last weekend, PURE Yoga on the Upper East Side welcomed the lovely Meghan Currie to their studio for a special workshop - "Love. Every. Moment."! She is well-known around the globe for her inspiring yoga videos, but to be in a real class with her is a unique, transformational experience. Her students are taught to stay present, "ride the breath", and to accept every fiber of their beings. Her moves are graceful and strong, her practice is invigorating and challenging, and the class itself was an incredible leap into self-discovery and self-acceptance. As she would say, the whole thing was absolutely "yum"! Thank you Meghan for your light and laughs! Highlights from International Yoga month! September is International Yoga month. Around the world, millions of yogis had the opportunity to organize events, offer free yoga classes to spread awareness of the health benefits, and gather together to experience the joy of yoga. United by Yoga to End Cancer! We launched our website, made new friends, taught several classes, and raised $1,750 for life-saving cancer research at Memorial Sloan Kettering Cancer Center in NYC. We made a new logo and slogan: United by Yoga to End Cancer! On September 13th, 2014 Wanderlust 108 gathered thousands of people for mindful triathlon, combining a 5K run, inspirational meditation by Elena Brower, and a massive outdoor yoga class taught by Sean Corn. Even though it started to rain, it did not stop Sean Corn from helping us to find our "true north". Thank you Brooklyn, for such a glorious celebration! On Sunday, Sept 14th, my dear friend and yogi - Sergey Chernykh -gathered students right on the shore at Brighton Beach in Brooklyn under the open sky for a donation based Yoga class. The class raised $150, which was donated to lifesaving research to Memorial Sloan Kettering Cancer Center! Thanks Sergey for being a part of our mission - united by yoga to end cancer! Hello all! Welcome to the Yoga out of Doors blog. We will be sharing healthy recipes, cancer statistics, yoga articles, and much more in the near future. Stay tuned!